The Pure Gold is the all-in-one package for anyone desiring achievement of Goals in grand style. It is one of its kind out there, tailored to your mental taste. You want to make Achievement of Goals easier and put an end to mere daydreaming without taking action? 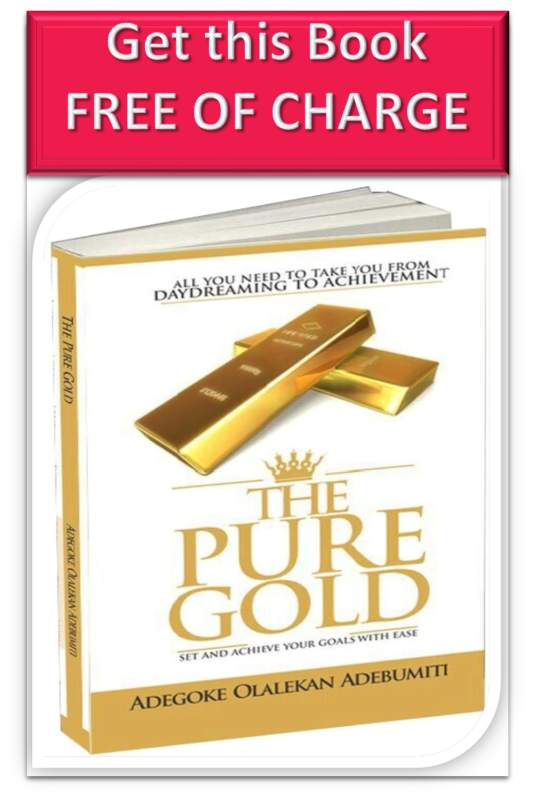 Then the Pure Gold is the right book for you, guaranteed! This book is $10 (Approximately #2,100) on Amazon (Confirm it here http://www.amazon.com/dp/B00IVT30SG ). But I will give you free of Charge – take me for my words. P.S. If you read book and it doesn’t give you your life a turn-around, I give you the right to come slap me. Lol. 5. Chapter Two: So You Want To Be an Achiever! This is the best book on Goals Setting. Get it free and end everyday struggle with getting things done. Smiles, Adewale. Thanks for the compliment. God bless you biggerly IJN! Ola, the download link normally sent to your email the moment your fill the form on this site. I will look into that to see if the error is coming from me. So lets get started with this book sir. You can download and read, Oluwakorede. Thanks, Olamide. Go get it!